Samsung is reportedly working on two other folding phones to join the Galaxy Fold in hopes of dominating the new smartphone form factor. People familiar with the matter told Bloomberg that the South Korean company is working on an external folding device similar to Huawei’s Mate X, as well as a clamshell device like feature phones of yore. The sources asked Bloomberg not to identify them. Those two devices would join the already announced Galaxy Fold, which features an internal display and folds like a notebook. Samsung will reportedly reveal the vertically-folding clamshell device late this year or early next year. Currently, the company is using mock-ups to fine-tune the design. It may feature a second external display, like the Galaxy Fold, depending on how customers respond to the Fold. The external folding device, however, will be thinner as it has no extra screen. Samsung reportedly considered releasing it first but chose to release the current Fold model instead. As such, a prototype already exists for the external folding device. Bloomberg’s sources said it would come after the clamshell device. Samsung is also considering incorporating in-display fingerprint sensors in its folding phones, according to reports. Along with developing new models, sources said the company is trying to improve the durability of the Galaxy Fold’s display. A crease reportedly appears on the panel after 10,000 folds. Samsung may offer free screen replacements to compensate for the issue. The imperfection develops on a protective film that covers the touch sensor bonded with the display underneath, according to the report. Further, Bloomberg’s sources said that’s why the company kept the device inside a glass display at MWC. 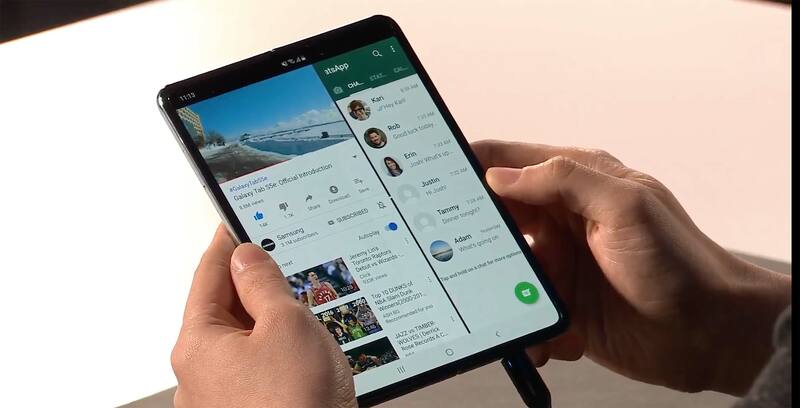 However, a Samsung spokesperson told Bloomberg the Fold was displayed that way to help divert people’s focus to the Galaxy S10 models coming out later this week. Regardless, Samsung is prepping several variations of the folding phone form factor. There’s likely a degree of experimentation on Samsung’s part, as folding phones are a new concept and no one really knows what the best form factor is yet. Releasing several variations is one way to find out.